Round instrument for the cars Wartburg 1,3 and B1000-1. Original spare part for display the engine temperature and the fuel gauge. 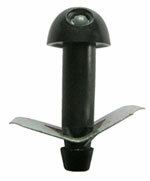 Sealing cap (single part) for the mounting place of the wiper arm. Fit to CZ models Trabant, Wartburg and B1000. Can be used for screw joints spanner gap SW 13. Metal retainer for the windscreen water bottles 1,5 liter of the Trabant, Muticar, B1000 and 2,5 liter of the Wartburg models. Jet for windscreen cleaning. Can be used for mechanical and electrical wash pump. Washer jet with only one adjustable jet. One kit of wipers and wiper arms for B1000 and B1000-1 (please note: four stroke models only use for types with old wiper linkage without grooved conical stub. Clip for mounting the door trim panels or the inner wheel covers. Fit to all types of Trabant, Wartburg, Barkas and many IFA vehicles. 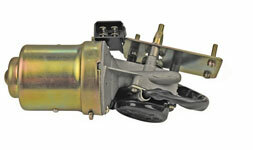 Wiper motor as universal unit with 12V sytem. This Repro part can be used for the car types: Multicar M22, M24, M25, Wartburg 353 and 1,3, Baraks B1000 and B1000-1, Trabant 601 (from vintage 88) and Trabant 1,1. Inexpensive option to the original spare part. The base plate can be turend to modificate the wiper motor for your car type. The wire connection have to be done byself.